On 11 April 2018, a 16-year-old youth from Azzun is arrested by Israeli soldiers at 3:00 a.m. He reports being interrogated multiple times without being properly informed of his right to consult with a lawyer and his right to silence. I was asleep when 3 Israeli soldiers came into my bedroom and woke me up. It was around 3:00 a.m. They were shouting “get up, get up...” I got up and went to the living room and my father told me the soldiers wanted to arrest me. The commander took me to the kitchen and told me he wanted to arrest me and said he did not want any trouble from me. 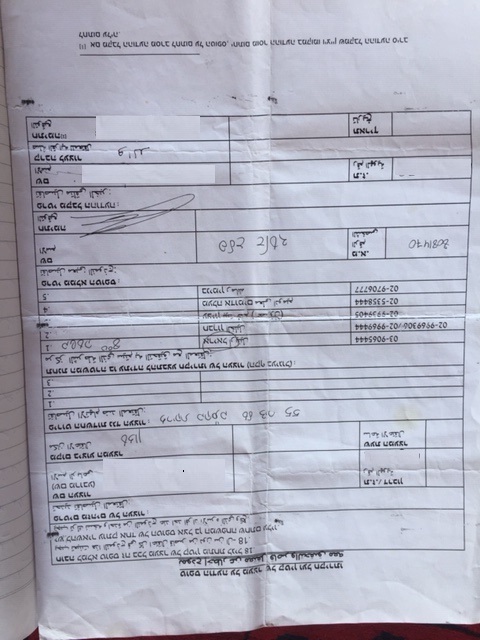 They gave my father a document with details about my arrest and asked him to sign it. It was a standard form typed in both Hebrew and Arabic but the information was hand written by the commander in Hebrew. I put my clothes on and I was immediately taken outside where I saw lots of masked soldiers. A soldier searched me, pulled my hands behind my head and threw me into the back of a jeep where I sat on the metal floor. Inside the jeep my hands were tied to the front with 2 plastic ties on top of each other. The ties were very tight and caused me a lot of pain. My wrists swelled and the ties left marks for a long time. I was also blindfolded. There were 2 soldiers inside the jeep with me and later more soldiers came on. One of them slapped me and beat me with the back of his gun. Another swore at me and cursed my father. They drove around the village and made more arrests and then I was taken to a nearby military base. On the way a soldier told me if I tried to remove the blindfold he would “bury me on the spot”. At the base I was taken to a shipping container where I was examined by a doctor. I sat on a chair and I was not given any food or drink. I was allowed to use the toilet once. I was able to sleep on the chair. I bent over a table and slept but just as I fell asleep a soldier shouted at me and I was startled and woke up. I instinctively tried to remove the blindfold to see what was going on and a soldier raised his hand and threatened to slap me. At around 7:00 a.m. I was taken to the police station in Ariel settlement where I was left on a chair in a room until around 4:00 p.m. when I was taken for interrogation. I later found out that my father went to Ariel but he was told I was not there. After waiting a long time he was told to leave. The interrogator was a policeman. He spoke Arabic and had a camera and a voice recorder. He removed the blindfold and told me to sit down and asked me for my name and age. He told me if I chose to remain silent and refuse to answer his questions he would take it as proof against me. He did not inform me of my right to consult with a lawyer. Then he told me I was accused of throwing stones and Molotov cocktails. I told him I had nothing to do with such things and denied the accusation. Then he accused me of lying and repeated the accusation but I continued to deny it. This lasted for about 5 minutes and then I was taken for fingerprinting and a photograph. About 15 minutes later I was taken back to the interrogation room and the interrogator repeated the same accusation. I denied them and told him I had nothing to do with such things. Then he showed me some photographs of clashes with soldiers and accused me of taking part. When I denied it he raised his voice at me and thumped the table and told me he would send me home if I confessed. He told me my father was waiting for me downstairs and all I had to do was to confess. This lasted for about 15 minutes. Then he showed me documents in Hebrew and asked me to sign them but I refused to sign. 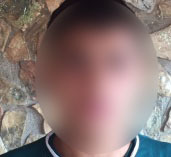 Then I was blindfolded and I waited in a room for about an hour and then I was taken in a jeep to the police station in Qedumim settlement where I was interrogated a second time. The second interrogator wore civilian clothes. He removed the blindfold and I saw he had a gun on his side. He asked me whether I had any illnesses and told me I needed to answer his questions despite my young age. He told me if I answered all his questions he would send me home. He did not inform me of my rights. Then he showed me images of clashes and accused me of taking part. I denied it and told him I did not take part. He questioned me for about an hour. Then I was blindfolded and taken to Huwwara military base but they refused to admit me and I was taken back to the jeep. Then a lawyer told me they were going to take me to Megiddo prison inside Israel. He took my name and my father’s number and told me I had a military court hearing the following day. When the lawyer left I was taken inside the military base where I was strip searched and taken into a room where I was examined by a doctor. They removed the ties and the blindfold and brought me food about 2 hours later. The cell had a puddle of water but I managed to sleep because I was very tired. The following day I was taken to Salem military court at around 8:00 a.m. I was hand cuffed and shackled and taken in a bus which drove for about 4 hours to Salem. My parents were not in court but a lawyer was there and the hearing was adjourned. The hearing lasted for about 2 minutes. The judge asked me for my name and he decided to keep me in detention. After court I was taken to Megiddo where I was strip searched and taken to the juvenile section. In all had about 7 military court hearings. At the last hearing I was sentenced in a plea bargain to 2 months in prison and fined 3,000 shekels. I also received a suspended sentence of 6 months in prison suspended for 5 years. I was released on 26 May 2018, about 2 weeks early because of good conduct. I was released at Al Jalama checkpoint where I was met by my father and brother. I arrived home at around 7:30 p.m. My mother had prepared 5 delicious dishes and I ate and went to bed.